Stefano Laghi career is based on a structured training program and a variety of important professional experience that led him to achieve an in-depth knowledge. His approach to pastry is versatile, with as many facets as the different skills acquired and the many roles played over the years. It is the sum of these steps that develop his background all around the world of pastry. In Stefano Laghi's opinion, pastry is a neat patchwork of techniques and balance. Rational production and inventiveness, chemistry and creativity, diligence, research and entrepreneurship, sacrifice, conviction and growth. According to Stefano, expertise starts from the basics: it is important to know the ingredients and techniques to be masters of a subject that can not be left to chance and that requires study and experience. The identification as a teacher and trainer is a difficult and rewarding task; it means to be responsible towards those who listen and those who believe in your knowledge. He started working as a pastry chef with ambition and desire for growth: after school, he threw himself headlong into his career and pastry competitions. To mention a few, in 1992, he won gold, silver and bronze at the Olympics in Frankfurt. He won the first two steps of the podium in Luxembourg in 1994. He has been putting a great deal of effort into training since 1991. In the same year he held the first course of airbrush painting. But this is just the beginning: for two years he was the director of the Etoile and then he expanded his teaching experience in some famous Italian and Spanish pastry schools, increasingly intensifying this branch of his business because he considers it the cornerstone of his profession as pastry chef. 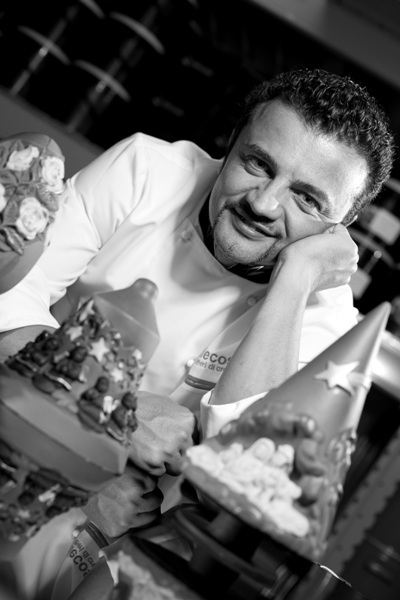 Even in his publications you can read about his willingness and his ability to pass on his knowledge: La pasticceria Secondo L’Etoile (1995), La Pasticceria passato e presente (1997), Dessert dessert dessert (2000), ABC dello zucchero (2004), Cakes (2012). "A book is perhaps the greatest satisfaction that you may have, even more than winning a competition: it is like an indelible signature that remains through the years, and it will be remembered even after you". Growth and research are two other points: up to 2009 he had been collaborating with PreGel in the research and development of products for pastry and gelato. Stefano Laghi developed the Chocoflex line for Pavoni Italia and he collaborated in the development of professional materials for Arte Bianca. In 2006 he set up decosil®, a leading company in the production of 3D silicone molds, to innovate and rationalise the production of items made of chocolate and then of artistic sugar. Iit is important the invention of LINEAGUSCIO® by decosil®, patented at a European level. Currently he is also the production manager at the Antonella Dolci bakery in Alessandria (Italia), he works as a demonstrator and consultant for Italia Zuccheri and for the Unigrà group. Thanks to his experience, he acquired an in-depth knowledge in different fields, from the chemical structure of the ingredients to the way the equipment is used. The entrepreneurial aspect completes his outline, what he teaches comes from his business experience. In 1996 he setup Pasticceria Mosaico in Ravenna (Italia) and he ran it for four years. In 2000 he established his own one-man consulting business and he expanded the horizon in 2006 founding Stefano Laghi Chocolats and decosil®. The latter still plays a crucial role in his expertise because it shows his pastry philosophy: one of his strengths is the ability to propose a pastry industry that is not only technically perfect and excellent, but also practical, easy and fast production, which can be cost- and time-effective. Forse cercavi: Crescita e ricerca sono altri due punti cardine: fino al 2009 collabora con PreGel nell’ambito di ricerca e sviluppo di prodotti per pasticceria e gelateria; per Pavoni Italia crea la linea Chocoflex e collabora all’ideazione di materiali professionali per l’arte bianca; Nel 2006 crea la decosil®, società leader nella produzione di stampi in silicone, per innovare e razionalizzare la produzione di oggettistica in cioccolato e successivamente in zucchero artistico. In questo ambito, importante è l’invenzione della LINEAGUSCIO® di decosil®, brevettata adrittura a livello europeo. Attualmente è inoltre direttore di produzione presso la pasticceria Antonella Dolci di Alessandria, collabora come dimostratore e consulente per Italia Zuccheri e per l’azienda Unigrà. Ed è attraverso tutte queste esperienze che riesce a crearsi un importante panorama di nozioni che lambiscono i diversi ambiti della pasticceria, dalla chimica degli ingredienti alla funzionalità dell’attrezzatura dedicata. Stefano Laghi thinks expertise is a steep staircase to be climbed with great humility, perseverance and awareness. And now his goal is to go on walking, pass on and teach what he has been taught so far.